Hey there! Today I want to talk about something that really hits home for me, starting a new job as an introvert. Starting a new job is hard enough, when you’re also an introvert, it can seem very scary. You have your nerves, not knowing anyone, and learning a new job rushing around your brain. However, there are some things you can do to make your first day a great day! The first day at a new job can be pretty rough for an introvert. It’s a lot of meeting new people, get-to-know-you stuff, and that can seem very overwhelming for an introvert. I actually started a new job last week! But, there are things you can do to help you prepare and make your first day at your new job a good one! Most people start their new jobs on a Monday, so use the weekend before to get yourself mentally ready for your first day. 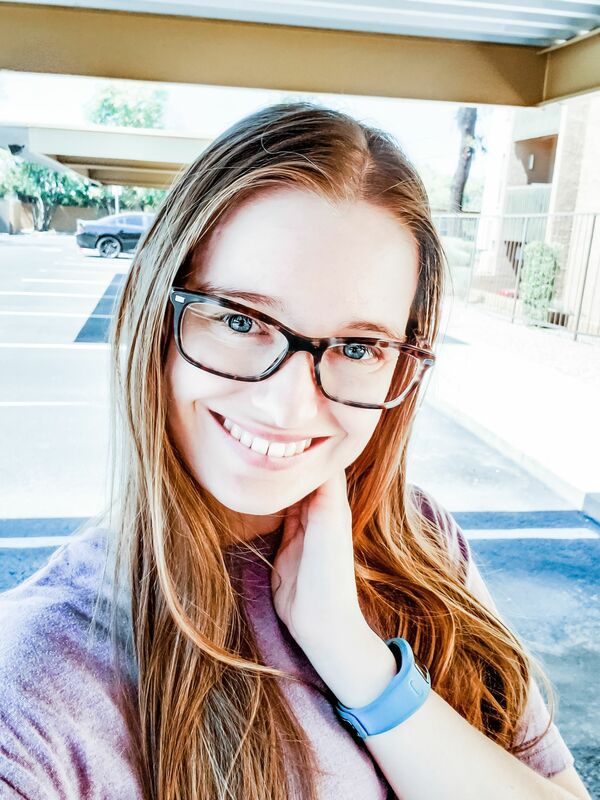 I know that I start to over-analyze how the day is going to go and worry if I’m going to make friends, so I try to do things that take my mind off of that. I try not to sit around and do nothing because that fosters my over-analyzing. I try to get things done like household chores so I don’t have to worry about them when I come home because I know I will be tired. At night, I would try to do something relaxing before bed. I took a shower the night before, but you could also take a bath, so a nice deep skincare routine, and then jump in bed and cozy up with a good book before going to sleep. I usually have a hard time sleeping the night before something important if I don’t take the time to try and relax. It’s important to make sure you have a good amount of energy “stored” before your first day. I say it this way because it depends on the job you’re going into. My job is an hourly job and they hired a handful of us, so I’m part of a class. Just about everyone was nervous like me. So, if you’re part of a class, your classmates are probably just as nervous as you. If you’re not in an hourly job where they hire many at a time, and you’re the only person hired, then your coworkers probably won’t see it as a big deal as you. By that, I meant that they aren’t thinking of it as big of a deal. Just someone new! They are happier as opposed to nervous, and I would use that energy to help calm you down. Introverts tend to overthink, which can lead to a lot of nervousness, especially on the first day. Remember that others are probably nervous as well, or they’re just happy that someone new is joining the team. The over-stimulation of your first day can make you feel tired before lunch. Introverts need solitude to recharge, and lunch can be the perfect time for that. I don’t suggest having lunch alone unless you really need to, but to find one or two people you really click with and to have lunch with them. Meaningful conversation during this time can really help you feel welcome and relax your nerves. Be selective with your energy, so you don’t completely drain yourself before your day is over. No matter what, your energy is going to be drained, that’s just what happens when our world has been designed for extroverts. Make sure to take the time after work to recharge your batteries. Do something you enjoy, watching Netflix, writing in a journal, drawing, reading a book. Since you will most likely have to go to work the next day, make sure you take some time to mentally relax before you physically go to sleep. There is nothing wrong with being an introvert, and don’t think you need to force yourself to be extroverted to fit in. Be yourself, and you will find the people who want to be friends. Take care of yourself and before you know it, you will find the routine that gives you a good balance of work life and solitude. 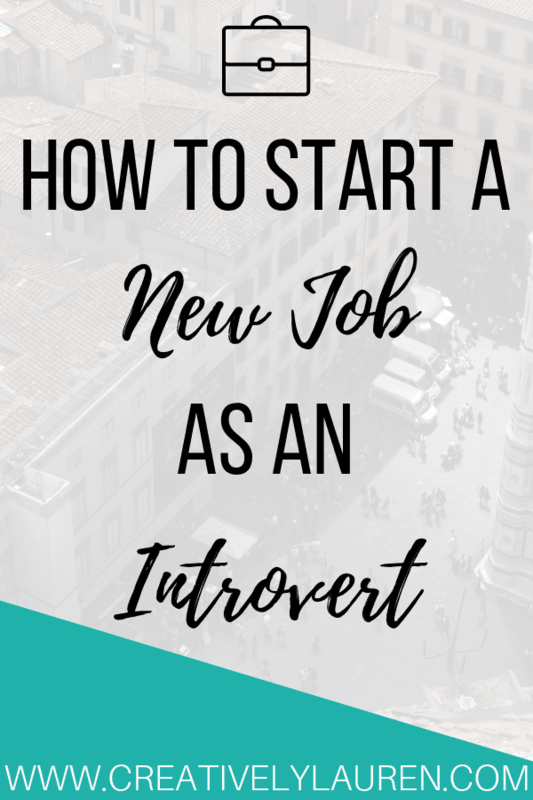 Are you introverted and started a new job recently? Let me know in the comments! Excellent article, Lauren! Wishing you peace and comfort as you adjust to this new job. Sounds like you are off to a great start.